If the only reason you plant a Red Twig Dogwood is for the bright red branches in the middle of winter, it would be reason enough. And, even though that is what most people think of when they think of Red Twigs, it is only the beginning for a shrub that guarantees four seasons of interest in your landscape. In the spring, the Red Twig Dogwood produces clusters of white blooms that have a light fragrance. During the summer, the dogwood has very pretty, medium green leaves that provide a nice backdrop for annuals and perennials. My favorite season for the Red Twig Dogwood, though, is fall. In late fall, the leaves will start to change from green to a beautiful, rich coppery purple. This was one of the last shrubs in my garden to drop all of its leaves, and I just loved seeing it every time I walked to my garage. The Red Twig Dogwood has a fairly loose growth habit, with new stems growing up from the ground yearly. It will grow to six to eight feet tall, and equally as wide, if left to itself. However, regular pruning will keep this shrub looking its best, since the reddest stems are those that are younger. Older stems will get grayish red with time. Pruning should be done after they bloom, or in late winter if you aren’t concerned with the flowers. If you have a very overgrown specimen, you can cut the entire shrub back to the ground, and it will be just fine, rewarding you with a flush of young red stems within a year. Fertilizing should be done in early spring. I use some organic granular fertilizer scratched into the soil around the base of the plant, and then I foliar feed with fish emulsion just as the shrub is starting to leaf out. The Red Twig adapts to almost any soil, but prefers slightly moist conditions. It does well in full sun to part shade. You can propagate Red Twig Dogwoods by taking hardwood cuttings in late fall. To do this, cut a stem that is about the thickness of a pencil. Cut the stem with bypass pruners into six to nine inch sections. Cut each section so there is a bud just below the top of the cutting and just above the bottom of it. Remove all side branches. Dip the cuttings into rooting hormone. The cuttings can be placed either directly into the ground (as long as the garden soil is mixed with some perlite or vermiculite for drainage) or in pots with a mixture of potting soil and vermiculite or perlite. A cold frame is a good place to put your cuttings, whether planted directly into the soil or in pots. Keep the cold frame closed over the winter. Once spring arrives, you can leave the cold frame open, or remove your pots to another area. Once the cuttings have rooted, you can plant them in a nursery bed (an out of the way area where they can grow a little bigger) or directly into your landscape. This can take up to twelve months, so be patient! Should you decide to plant a Red Twig Dogwood, it would be a good idea to place it where you can see it from your windows. It will give you something to look at in the winter months. Red Twigs are excellent used in mixed shrub borders, along fence lines, or wherever you would like a bit of attractive screening. Overall, the Red Twig Dogwood is an extremely easy-care plant that gives you a ton of interest in the garden. For a low-growing plant with incredible foliage, it’s hard to beat heuchera. When you add pretty, delicate blooms and the fact that most heucheras are evergreen, what you end up with is a “must-have” plant. There are nearly 300 known varieties of heuchera (a North American native), also called “coral bells” or “alum root.” In general, heucheras grow to about eighteen inches tall (not counting the flower spikes) and around eighteen inches wide. Their blooms grow on spikes of delicate “bells” in shades of red, pink, white, and purple, generally blooming for four to eight weeks in late spring through early summer. Recent varieties have made the blooms more prominent. 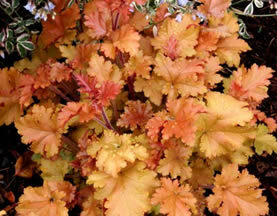 But it’s the foliage that makes heuchera a winner. Purple, black, red, orange, brown, silver, chartreuse-you name it, you can most likely find a heuchera in that color. Heuchera prefers part shade, although some cultivars do better in full sun. They like soil that is average to rich fertility, moist, and well-drained. Heavy soils can be amended at planting time by incorporating compost or leaf mold into the soil from the planting hole. 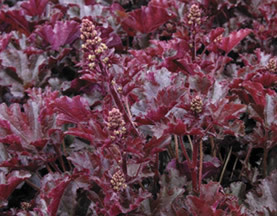 Heucheras are great plants for either edging a bed or using a group as a focal point. They suffer from very few pests and diseases, but powdery mildew can be a problem. Be sure to give them some room so they will get good air circulation. 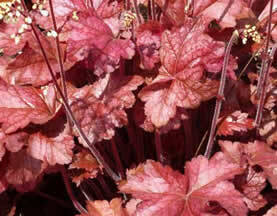 Heucheras tend to be shallow-rooted, and will heave in the winter if there is a lot of freeze/thaw action. To prevent them from heaving, give them a good, three inch layer of mulch in late fall. Since heuchera prefer moist conditions, be sure to water in hot, dry weather, giving the plant about one inch of water per week. They can be fertilized with a balanced organic fertilizer in early spring. Divide plants every three years or so, or when you notice that the stem is looking woody or blooming diminishes. Mulch heucheras in the fall to prevent heaving, but don’t put the mulch up against the crown of the plant, or it will rot. Pull the mulch back from the crown two to three inches. Deadhead after the blooms fade to promote re-bloom. There are three main ways heuchera can be propagated: seed, division, and leaf-bud cuttings. Seed: The thing to note when trying to propagate from seed is that cultivars will not come true from seed-only species will. So, for example, Heuchera americana is a species heuchera that will grow true from seed. Heuchera americana ‘Chocolate Veil’ is a cultivar of H. americana, and will not grow true from seed. To grow from seed, the most important step is to stratify the seeds, meaning that the seeds are stored in the cold (a refrigerator will do) for at least six weeks. After stratifying, sow the tiny seeds on top of your seed starting medium, as seeds require light to germinate. They will germinate fairly quickly. Care for them as you would any other plant grown from seed, including hardening them off after danger of frost. Seedling heucheras can then be planted in their desired location in the garden, or placed in a nursery bed for a growing season until they reach a larger size. 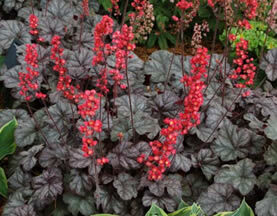 Division: Divide heuchera as you would any other perennial. Dig the plant out of the ground and cut the root mass into pieces with a shovel or knife. Replant divisions with the crown at the soil level. This can be done every two to three years to keep the plants vigorous. Leaf-bud Cuttings: Leaf-bud cuttings are a type of cutting that consists of a few leaves, but most importantly, of a section of the stem from the main plant. This is important because only the main stem has growth buds on it, which is where foliage will grow from. Take leaf-bud cuttings of heuchera any time during the growing season, although spring is best because it allows the parent plant plenty of time to recover before winter. Dip the cutting in rooting hormone, and place it in either seed-starting mix or a 50/50 mix of peat and perlite. Keep it moist, cover the cuttings with a plastic bag (supported so it doesn’t come into contact with the leaves) and place it in a shady location. Once you have roots, you can plant it out in your garden or into a nursery bed. ‘Crimson Curls’ has curly, rich purple leaves with pinkish undersides. This variety works well in beds as well as containers. ‘Crimson Curls’ is compact, growing about eighteen inches wide and tall. Blooms in late spring, sporting long-blooming cream flowers. Hardy in zones 3 through 8. Photo Courtesy of Proven Winners. ‘Sparkling Burgundy’ has large, deeply lobed leaves that open bright magenta and mellow to a deep burgundy color. The white blooms appear in spring on eight inch purplish-red stems. ‘Sparkling Burgundy’ is hardy in zones 4 through 9, and can be planted in full sun to part shade. Photo Courtesy of Terra Nova Nursery. 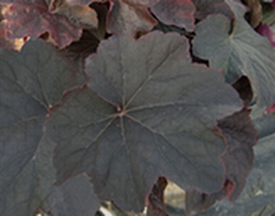 ‘Hollywood’ is a gorgeous heuchera with purplish-black leaves frosted with silver. The leaves are nicely ruffled. In spring, bright coral-red blooms will appear, and will reappear all summer. ‘Hollywood’ is hardy in zones 4 through 9, and can be planted in full sun to part shade. Photo Courtesy of Terra Nova Nursery. 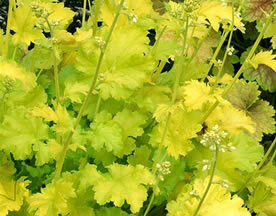 ‘Lime Rickey’ has bold, beautiful chartreuse leaves topped with spikes of white blooms in spring. The chartreuse leaves darken to a pretty lime green color by fall. ‘Lime Rickey’ is very compact, growing only 8 inches high and about 15 inches wide. It is hardy in zones 4 through nine, and should be planted in partial to full shade. Photo Courtesy of Terra Nova Nursery. ‘Marmalade’ has unique foliage that starts out as a bright copper color, and changes to a raw umber color by fall. A bit of a surprise-the undersides of the softly scalloped leaves are hot pink! ‘Marmalade’ has spikes of dark red blooms in summer. It grows to about 12 inches tall and 15 inches wide. ‘Marmalade’ is hardy in zones 4 through nine, and should be planted in part shade. Photo Courtesy of Terra Nova Nursery. ‘Obsidian’ has maroon leaves that are so dark they appear black. They keep this color all season, contrasting beautifully with the creamy white flowers that appear in early summer. It is a compact plant, growing only 10 inches tall and about 15 inches wide. ‘Obsidian’ is hardy in zones 4 through 9, and should be planted in full sun to part shade. Photo Courtesy of Terra Nova Nursery. ‘Mocha’ has dark, coffee-colored, deeply lobed leaves that will darken to near-black in the sun. It will grow up to 15 inches high and 24 inches wide. Creamy white blooms appear in mid to late summer. ‘Mocha’ should be planted in full sun to part shade, and is hardy in zones 4 through 9. Photo Courtesy of Darwin Plants. Heucheras play well with many different plants. Shade tolerant varieties can be planted with hostas, bleeding hearts, hydrangeas, astilbes, tiarellas, heucherellas, and ferns. 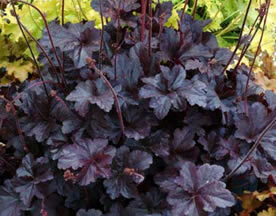 Sun tolerant heucheras would look beautiful planted with irises, campanulas, daylilies, columbine, and phlox. With so many colors available, the combinations are nearly limitless!